« libre.fm – what’s the point? Luke Barrington, a Music Information Retrieval researcher at UCSD, is trying to improve the state of the art in automatic playlist generation. He’s conducting a survey and he needs your help. If you are interested in helping out, take the survey. With music similarity sites like Pandora.com or iTunes’ Genius feature that recommends playlists, based on a song that we like, our MIR domain of music similarity and recommendation is finding a mass audience. But are these systems any good? Could we make something better? This is what I’m trying to figure out and I would like to include your opinion in my analysis. 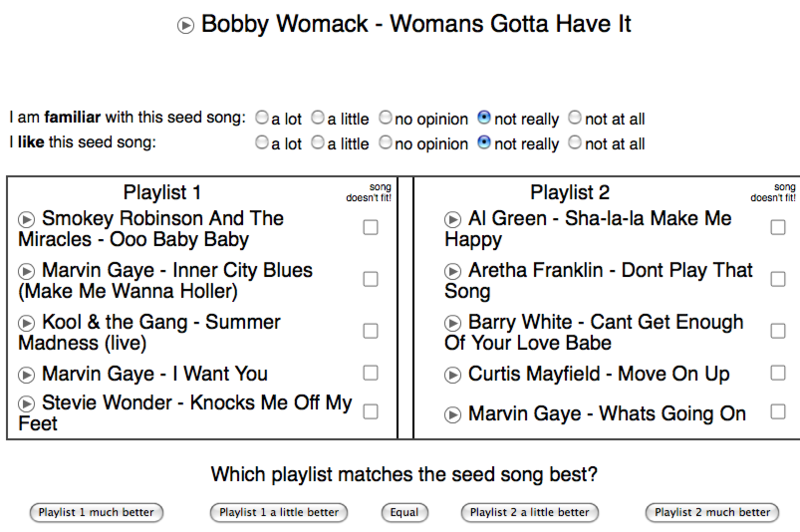 We are conducting an experiment where you can listen to playlists that are recommended, based on a “seed song”, and evaluate these recommendations. We are comparing different recommendation systems, including Genius, artist similarity and tag-based similarity. Most importantly, we’re are trying to discover the important factors that go into creating and evalutating a playlist. To learn more, ask questions or make suggestions, feel free to drop me a line. This entry was posted on April 24, 2009, 2:15 pm and is filed under java, research. You can follow any responses to this entry through RSS 2.0. Both comments and pings are currently closed. I don’t have time for creating a login and taking the survey at that site right now (or maybe ever), but after reading this blog for a while as a way of understanding what seems to me to be a very broken attitude towards what music really is, I feel like I should leave a quick comment about something that just occurred to me as I read this post and once again saw images of “music” increasingly coming to mean “a steady dripline of passively consumed opiate, defined (and therefore, eventually, virtually, created) by lifeless machinery – what I mean is that eventually the machine-readable aspects of musical expression will become the only ones given any thought in the process of production (the word “creation” doesn’t really apply here) and all others will atrophy, maybe taking any human joy they contributed to in their subtle way with them. So, obviously, I’m interested in this subject, but not in an uncritically enthusiastic way. That said, if there’s going to be machine recommendation, would it be too much to ask for there to be an aspect to it that allows for more breadth and variety, rather then just “feed me more of the same”? My immediate thought is that perhaps more emphasis could be placed on what products listeners considered to be so outside of their sphere of interest as to not even be considered “music” by them, and to what degree, and work from there, at least partially. Granted, an approach incorporating this aspect would require more active input from listeners (not suitable for braindead “people who bought x also bought y” type implementations at points of sale, probably) but it would allow for some vastly richer stretches for those who want their exposure to *music* to broaden, not just replacing a worn-out product with a shiny new version of the same thing under a different name. I realize none of this will be interesting to anyone who’s already lost the ability to distinguish between the concept of “music” and the concept of “efficiently supplied consumer product”, but just in case any other kinds of folks are reading this, I thought I’d respectufully toss it out there, with apologies for soapboxing in a manner that may not be quite in line with the main focus of this blog (sincerely). Just food for thought.